Enjoy this easy and delicious recipe for pork chops slow cooker. Great for your whole family, Pork Adobo is one of the most popular traditional Filipino dishes and is enjoyed by all classes. In this crock pot version, pork is slow cooked in soy sauce, vinegar, crushed garlic, peppercorn and bay leaf. Adobo is typically served with steamed white rice, but we prefer using steamed brown rice as it is much healthier. This crock pot Adobo recipe can also be made with chicken or a combination of pork and chicken. For information about eating pork safely, please see the health information following the recipes. Season pork with some salt and pepper and place in your slow cooker or crock pot. Cook on low for 8 to 10 hours or on high for 4 to 5 hours. 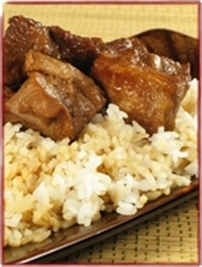 Serve Pork Adobo with steamed brown rice. For a little zing: add a little crushed ginger. Ginger adds a unique flavor to your pork/chicken adobo. For crispy adobo: remove the pork and fry it in coconut oil before placing on top of rice and pouring adobo sauce on top. Pork adobo not your favorite? Here is another favorite way to cook pork chops slow cooker. For those of you craving German cooking, these pork chops with sauerkraut taste just like Kasseler (Kassler) and are both easier to prepare and cheaper to make! The combination of apples, potatoes and sauerkraut is a real winner for both children and adults! Instead of using cooked sauerkraut, consider making or purchasing raw sauerkraut with all the wonderful digestive enzymes intact! For why sauerkraut is healthy to eat read: Sauerkraut: The Miracle Cabbage. Want to make your own? Read How to Make Sauerkraut, by Amy Grisak. Use 4 pork chops if you have a 3-1/2 to 5 quart slow cooker. If your slow cooker is a 5-6 quart size, use 6 pork chops and keep the remaining ingredient amounts the same. In a 3 ½ to 5-quart slow cooker (4 pork chops) or a 5 to 6-quart slow cooker (6 pork chops) place potatoes, carrots and onion. Top with pork chops. Cover and cook on low heat setting for 5-6 hours or on high heat setting for 2 ½ to 3 hours. Turn crockpot to high heat setting, add the apple slices and cook 30 minutes more. Transfer to serving dish. Serve with sauerkraut and garnish with snipped fresh parsley, if desired. Cut veggies into bite sized pieces. Vegetables intended for slow cookers are cut into bite-size pieces for even cooking. Some veggies take longer to cook than others in a crock pot. By cutting them into ½ inch pieces, you can be sure they will be tender and ready to eat when the meat is done. Pork is one of the oldest sources of meat, with domestication of pigs documented as early as 5,000 BCE. Today it is estimated that 38 percent of the world’s meat production is pork, although its consumption varies widely throughout the globe. Traditional preparation of pork involved salt-curing followed by smoking to preserve it, or marinating fresh pork in an acidic medium, usually vinegar, prior to cooking. Yet today some people simply cook fresh pork without giving any particular attention to traditional methods of preparation. While Pork is widely consumed, there are questions about the safety of eating it. For example both Judaism and Islam caution against eating pork. Certain Christian and other religious sects also consider it taboo to eat pork. It may be that the common diseases that swine and humans share are one of the reasons that eating pork was forbidden by some ancient religious dietary laws. For example, swine flu is one common disease that humans share with pigs. There are two helminth (worm) parasites that effect humans and pigs alike: Trichinella Spiralis, which causes trichinosis and Taenia Solium,the tapeworm. Why do we recommend that you marinate your pork chops for 12-24 hours in vinegar before making pork chops slow cooker? Because it is best not to eat unmarinated, pastured center-cut pork chops. For more information about this please read: How Does Pork Prepared in Various Ways Affect the Blood, by Beverly Rubik, PhD. The oldest and most traditional method of preserving and making pork safe to eat is by treating it with sodium chloride (table salt) and a natural sweetener, such as maple sugar and sometimes with a few spices for flavor. This method goes back to the times before refrigeration and was originally employed to preserve the meat. The use of salts to pickle pork has also been shown to kill taenia solium after twelve hours. For more information about this read: How Does Pork Prepared in Various Ways Affect the Blood, by Beverly Rubik, PhD. As used in this pork chop slow cooker recipe, another method of treating fresh pork is to marinate it in an acidic medium. This is an important traditional food preparation technique that can kill or at least inhibit the growth of most bacteria, keeping fresh pork from spoiling and safe for consumption. Acidic treatment of pork may also kill parasites, too. In conclusion, you should always use the highest quality fresh pork from sustainable small farms raising pastured livestock and either cure it with salt or marinade it in vinegar. Nowadays most "cured" pork is also treated with nitrates to extend the shelf life and add flavor. There is a lot of evidence that supports that consuming nitrates is not good for you since it may lead to the production of nitrosoamines (carcinogenic) in our stomachs. For this reason it is best to consume "uncured" pastured bacon, prosciutto and ham. I know this sounds counter intuitive, but pork that IS cured with salt but NOT nitrates is labeled as "uncured" and it does not have the pink color that results from the use of nitrates. The best study we have found that describes the problem with eating unmarinated pork and explains why preparing pork as described above is vital: How Does Pork Prepared in Various Ways Affect the Blood, by Beverly Rubik, PhD. Consuming unmarinated cooked pastured pork produces blood coagulation and clotting in blood examined at five hours after eating; however, consuming marinated cooked pork does not produce any blood coagulation or clotting. Consuming processed forms of pastured uncured pork, including bacon and prosciutto, does not produce any blood coagulation or other visible changes in the blood at five hours after eating. Always marinade pork for 12-24 hours in vinegar before making pork chops slow cooker. Avoid lifting the lid while cooking pork chops slow cooker because it will release the steam and lower the temperature in your crock pot by over 15 degrees, setting the cooking back by up to 20 minutes. Fill your slow cooker at least half full when making pork chops slow cooker for best results. Be sure to defrost big chunks of meat before making pork chops slow cooker. They will take much longer to cook and may not heat fast enough to prevent bacterial growth. Spread out the preparation if you are rushed in the morning by preparing all or part of this pork chops slow cooker recipe the night before and refrigerating it in the crock overnight. In the morning, simply place the crock into your cooker, add any remaining ingredients and turn in on. Don’t turn it on before inserting the crock since putting a cold container in a pre-heated cooker may cause the stoneware to crack. Many dishes like will taste best if you brown the meat in a frying pan before placing it in your slow cooker. Browning your pork chops before putting pork chops slow cooker will seal the juices in the meat and provide more flavor. Although this step will make some dishes taste better, it is not absolutely necessary. Same goes for sautéing onions and garlic ahead of time, it makes for tastier results but is not necessary. Crock pots come in a range of sizes from one to seven quarts. Be sure to use the appropriate size for your recipe so your cooker is at least half full. If it isn’t and you only have one slow cooker, consider doubling or tripling your recipe and then freezing the leftovers. Because we are busy moms, we never just cook a single meal. We always cook enough so we have leftovers for lunches and another meal or two that we can squirrel away in our freezer for nights when we are short on time. Slow cookers should cook food between 180 -200 degrees on the low setting and between 280-300 degrees on the high setting. From time to time you should fill the crock of your slow cooker ¾ full and let it go for 8 hours before quickly opening the lid and using a food thermometer to check the temperature. 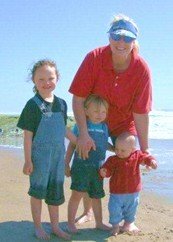 Share your favorite recipe – it is super easy!